2. 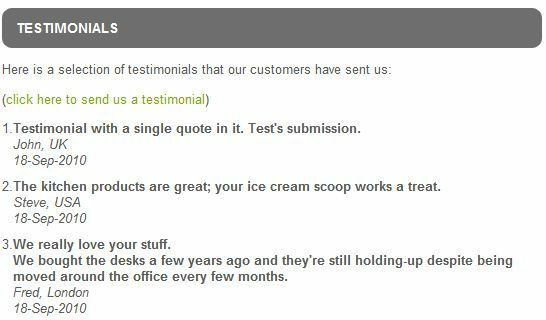 Email Notification (it emails the merchant a copy of submitted testimonials as soon as they're submitted by your site visitors). 3. Side Panel Admin Count - The admin left panel stats box shows a count of the new (ie unprocessed, newly-submitted) testimonials with a link to easily view/edit the testimonials. 4. 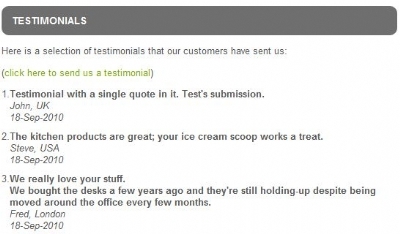 Approval (where you flag relevant testimonials as approved for publication on your site). All of these aspects are configurable, but work well out-of-the-box with the default options. Which fields are shown on the entry screen. Which fields are mandatory on the entry screen. The field labels on the entry screen. The page heading on the entry screen. The page heading and other text on the list screen. The number of records to display on the side-panel diplay. The order of the testimonials on the side-panel diplay (randomly picked items shown by default). Email Notification to merchant can be switched on/off. Email Notification can be sent to any email address you want (ie doesn't have to be your generic vpasp "xemail" address). There are many other configuration options, and the overall format can easily be tweaked too. 01 24-AUG-2010 Initial version - Big Yellow Zone Testimonials For VP-ASP. 02 26-NOV-2010 Upgraded BYZ162 (from V01 to V02). 03 27-JUN-2011 Upgraded BYZ038 (from V12 to V13). Changed names of testimonial entry/list screens to make them more seo-friendly, and also added meta tags for them. Split vpasp-version specific differences into separate files where possible to help make maintenance easier. Added extra function and template field to be able to display testimonials on a main page (via template fields on things like a content or home page template, or via direct function calls). 04 03-JAN-2012 Upgraded BYZ038 (from V13 to V15). Upgraded BYZ162 (from V03 to V05). Changed to use the generic BYZ cursor opening/closing functions to help avoid cursors getting blanked-out with 8k/memo (text/ntext) bugs. Please Note: If upgrading from a previous version of BYZ066, you must make sure you are using V14 or above of BYZ038 before upgrading to BYZ066 V04 or above. 05 08-SEP-2012 Upgraded BYZ038 (from V15 to V18). Upgraded BYZ036 (from V10 to V13). Upgraded BYZ033 (from V13 to V16). Upgraded BYZ162 (from V05 to V08). Added merchant email facility/option so that the site owner can be informed when a new testimonial is submitted. Added extra function and installation step to display the count of unprocessed/new testimonials on the admin side panel. Added extra logic to encode/decode special characters where appropriate. Added extra notes to the main configuration file to indicate whether values should be html-encoded or not. Changed to use more library functions from the BYZ038 tool where appropriate. Please Note: If upgrading from a previous version of BYZ066, you must make sure you are using V18 or above of BYZ038 before upgrading to BYZ066 V05 or above. BYZ066 V05 or above will NOT work with V17 or below of BYZ038. Please Note: If upgrading from a previous version of BYZ066, please make sure you add the unprocessed/new testimonials count/link to your admin side panel as per the installation step that was added as part of this release. For a list of effected files and other release notes/help, please see the version history readme file that comes with the zip file.